Rob was named Chief Lending Officer in January 2017. Prior to 2017, he served as a Vice President. 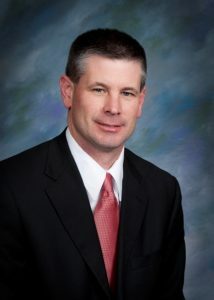 Rob attended Hutchison Community College and then graduated from Kansas State University with a degree in Agri-business. He then began his Farm Credit career as a loan officer in 1993. Rob grew up on a wheat and cattle farm in Kingman County where he attended Cunningham High School. Rob and his wife, Sheila, live in Kingman, KS and have 3 daughters, Allie, Grace and Marissa. In his spare time, Rob enjoys traveling, farming and spending time with family and friends.